The design of the ABI MOBILRAM TM14/17V is focused on low transport weight, paired with high torque absorption and maximum piling length. This telescopic leader mast in box design is suitable for piling and drilling applications. 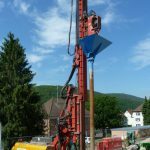 The VSL version is built in tubular mast design and suitable for piling applications.